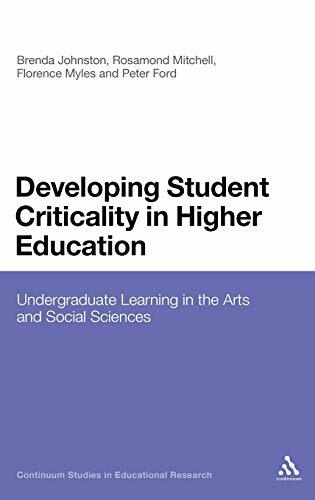 [PDF] Developing Student Criticality in Higher Education: Undergraduate Learning in the Arts and Social Sciences (Continuum Studies in Educational Research) | Free eBooks Download - EBOOKEE! Description: Critical thinking is a major and enduring aspect of higher education and the development of criticality in students has long been a core aim. However, understandings of criticality are conceptually and empirically unclear. The book combines a well developed conceptual discussion of the nature of criticality appropriate for the twenty-first century, the extent to which it is attainable by arts and social science undergraduates, and the paths by which it is developed during students' higher education experiences. Drawing upon empirical accounts and case studies of teaching and learning in different disciplines, this book critically analyses higher education curriculum and policy documentation to explore higher educational processes, encouraging a re-evaluation of practice and educational values, and enabling the development of curricula which incorporate systematic attention to the development of student criticality. This book proposes a rounded conceptual vision of criticality in higher education for the twenty-first century. No comments for "[PDF] Developing Student Criticality in Higher Education: Undergraduate Learning in the Arts and Social Sciences (Continuum Studies in Educational Research)".